Fall is upon us, which means it’s the best time of the year to enjoy winter squashes of all kinds. Spaghetti squash, pumpkin, butternut squash, buttercup squash, … I never used to eat them much, as I found them quite intimidating. I have since learned that there is nothing to be scared of, as squashes require very little in the way of additional ingredients to make them taste absolutely delicious. Most of them offer a flesh with a subtle, yet pleasant taste that goes well with many kinds of meat or fish preparations. 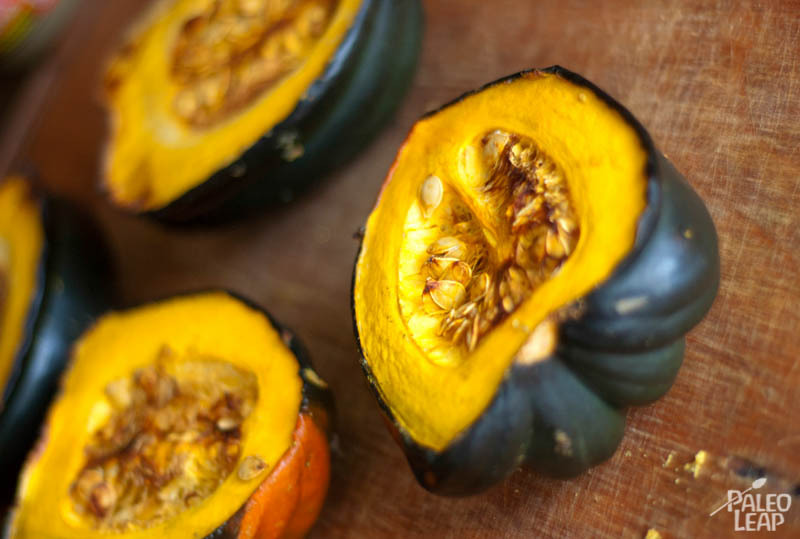 I thought it would be a good idea to share with you a very simple squash recipe. This is especially suited for those of you who share the initial feelings I did with squashes. That being said, like anything, you’ll probably find yourself get more creative with squash recipes the more you cook with them. 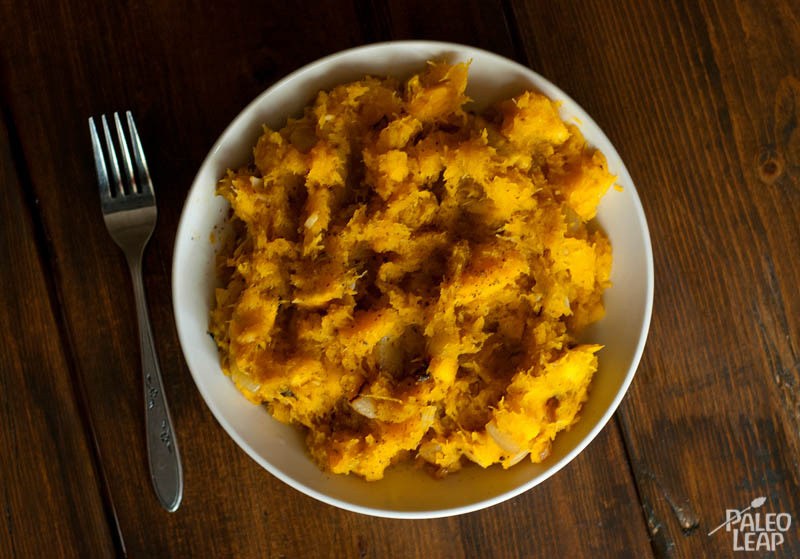 The spices used here (garlic, coriander and nutmeg) complement well the fall accents of this side dish and are used to augment, but not overpower, the subtle taste of the acorn squash flesh. Acorn squash, also known as pepper squash (because of its peppery taste) is a good source of vitamin C, potassium and manganese. It is mostly starchy, which makes it a healthy source of carbohydrate that’s low in fructose. It’s usually either boiled or baked and it can be prepared with many different spices and served alongside a multitude of dishes. This Paleo recipe makes a great thanksgiving side dish and goes especially well with strong tasting meat dishes like those of red meat. It also makes for a good alternative to mashed potatoes, for those who prefer not to eat regular potatoes or for those who’d like to try something different. Cut each squash in half, but leave the seeds in. Place cut end up on a baking sheet and roast them for about 50 minutes to an hour, long enough so that the flesh is fork tender. Remove once cooked and let cool for several minutes. Meanwhile, in a medium skillet over a medium heat, saute the onions in the cooking fat. Cook for close to 10 minutes, until the onions are translucent and begin to be golden brown. Add the garlic to the skillet, followed by the coriander, nutmeg, salt and pepper. Continue to cook for about 2 minutes. Remove the seeds from the squash and discard. Spoon out the tender flesh and discard the skin. Roughly mash up the squash and add it to the skillet. Mix well. Only leave on heat long enough to blend flavors. Serve alongside a tender roast or steak. Enjoy!